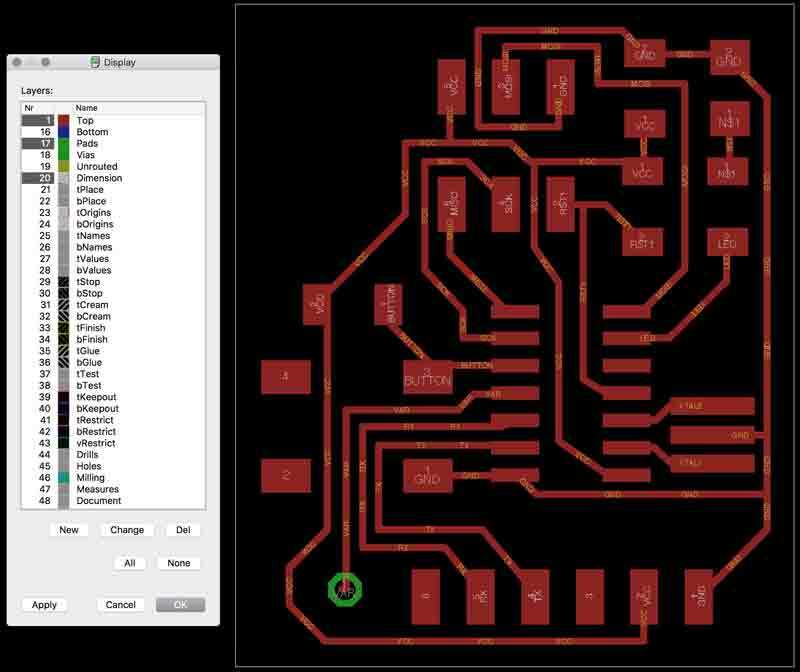 I need to export the board design from EAGLE, generate the mill paths and solder the electronic components. The board is ready to be cut; EAGLE's job is complete. Time to export. From the View> Layer settings... menu, set all the layers to invisible except Top, Pads and Dimension. 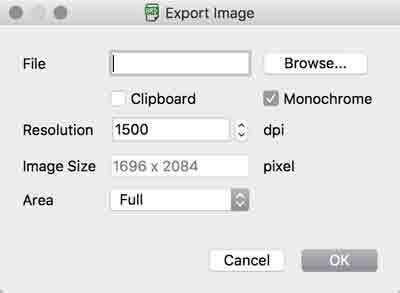 Export the file as a monochrome PNG at 1500 dpi. The PNG may not be exported in perfect condition but can quickly be edited in a PNG suitable editor, i.e. Photoshop, Inkscape. I did not find a good way to export a PNG for the outline cuts. EAGLE has a thin line it considers the outer border of the board and will export that line. 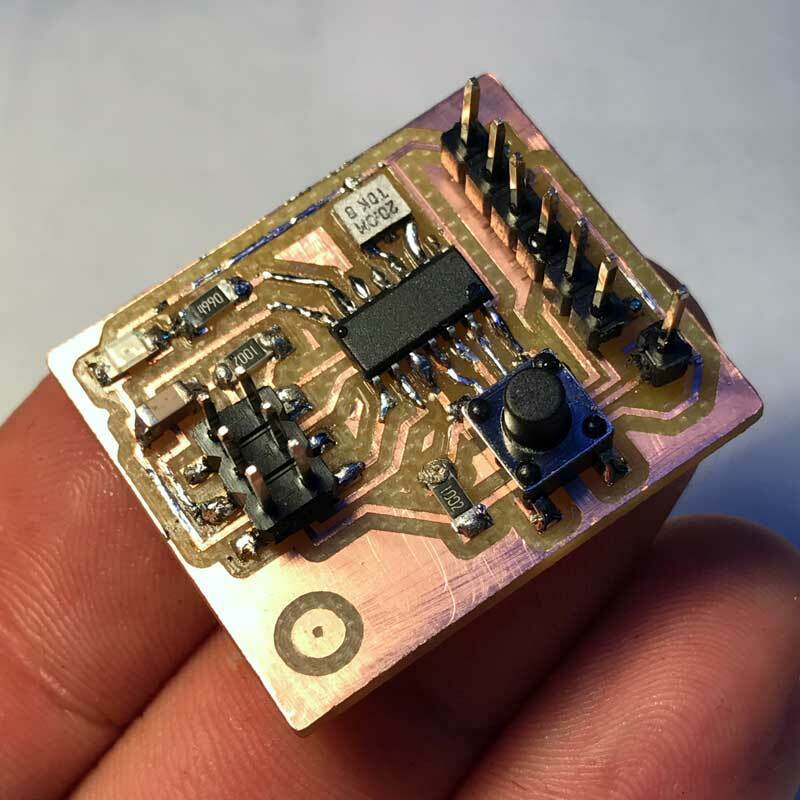 The line, however, is too thin for Fab Modules. I deleted the line from the trace PNG and deleted the traces from a duplicate of the file to be used for the outline. I also slightly rounded the corners of the outline and added the eye graphic to the traces. 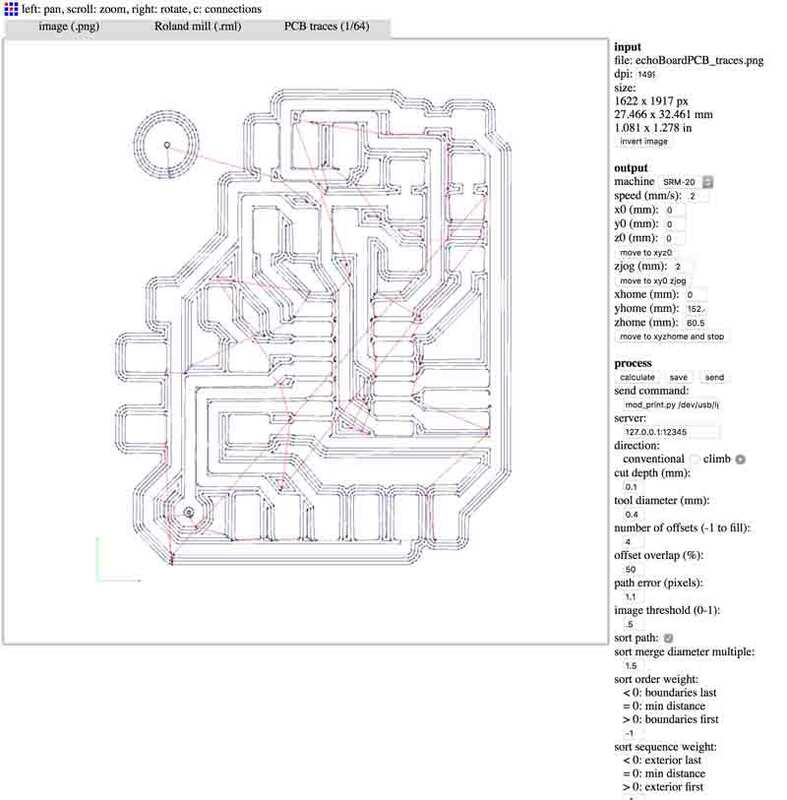 Now the outline and trace files can be converted to tool paths in the Fab Modules. On final inspections prior to milling, thankfully, I discovered some mistakes. 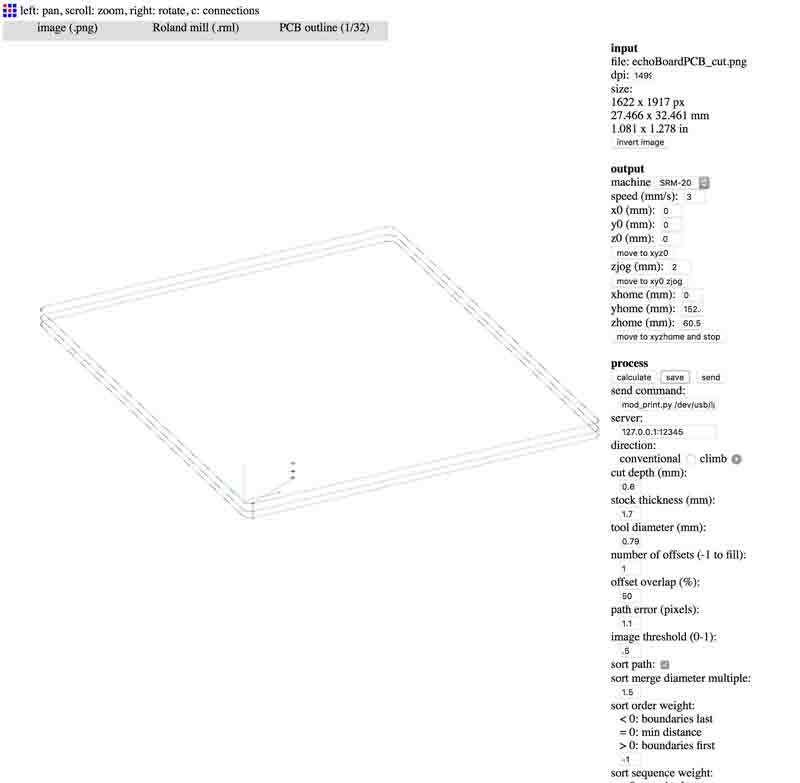 Double check the dimensions in the input information on the upper-right hand corner of the Fab Modules page. Above, you will see inconsistencies. For instance, my PNGs were nearly double the size drawn in EAGLE! 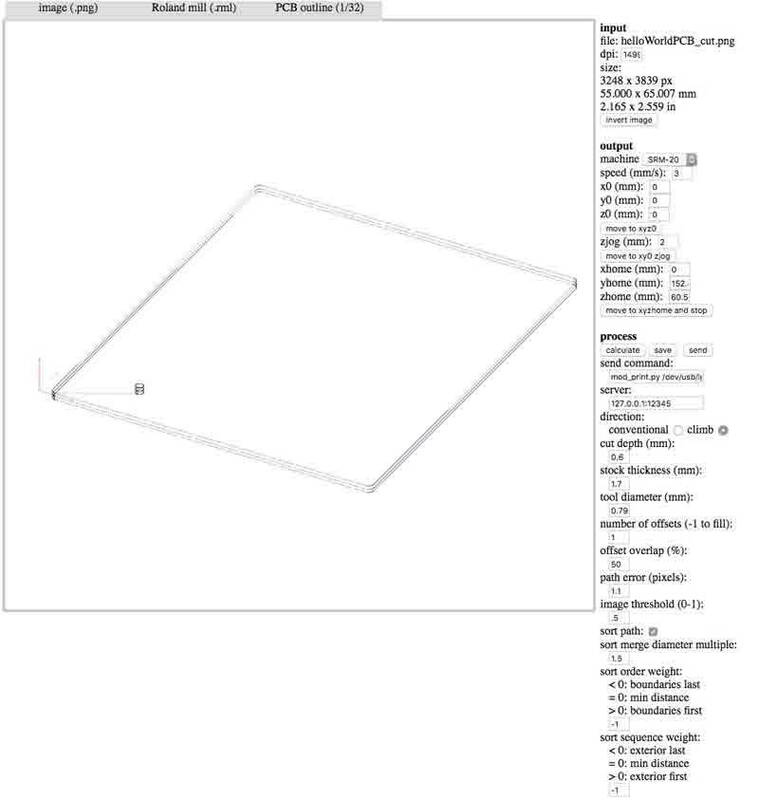 I found Adobe Photoshop doubles the dimensions of the exported PNG upon opening. In pixels, the EAGLE output is: 1696x2084 and upon opening in Photoshop: 3398x4174. 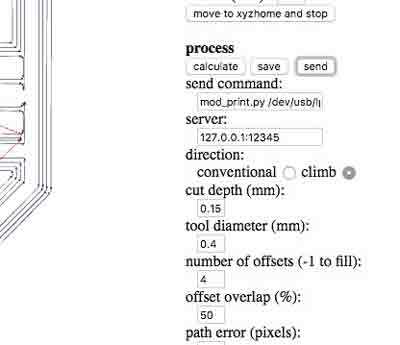 To solve the error, I scaled the PNGs in photoshop by 0.49928126. Fortunately, the image fidelity sustained. Next, I realized the outer dimensions of the trace and outline PNG files were dissimilar. This was my fault and would have resulted in an outline cut offset from the traces. I fixed the issue in Photoshop and took the exported PNGs back through Fab Modules. Now the input information is correct and the tool paths aligned. Check that the x0, y0, and z0 coordinates are correct. For me the coordinates were automatically changed to 10,10,10. 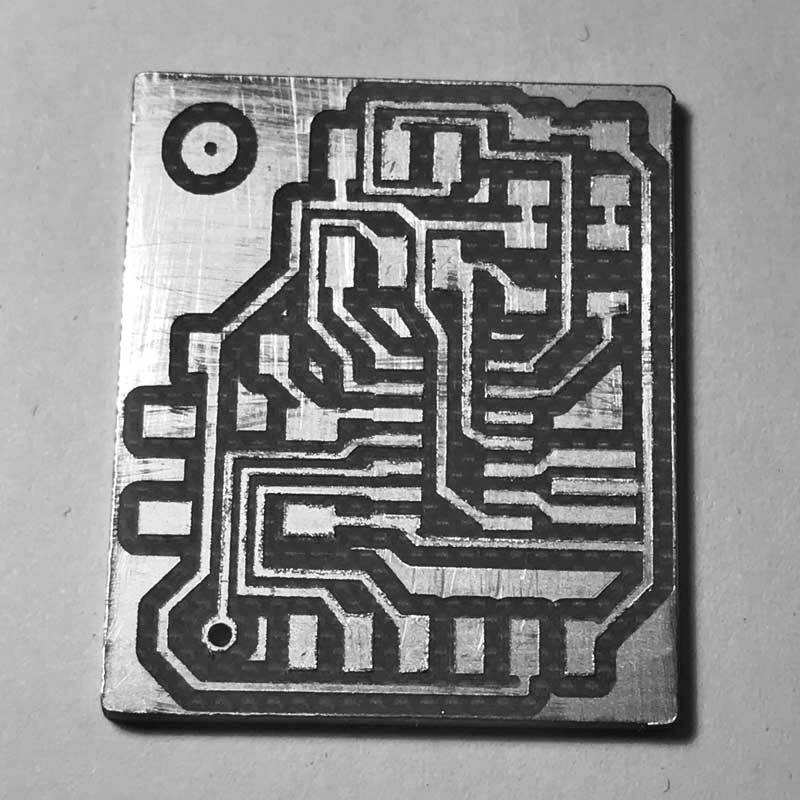 After milling a bit, I noticed the paths around the traces were not cutting through the copper. We resolved either the bit is dulling or the substrate was not evenly adhered to the foam block. 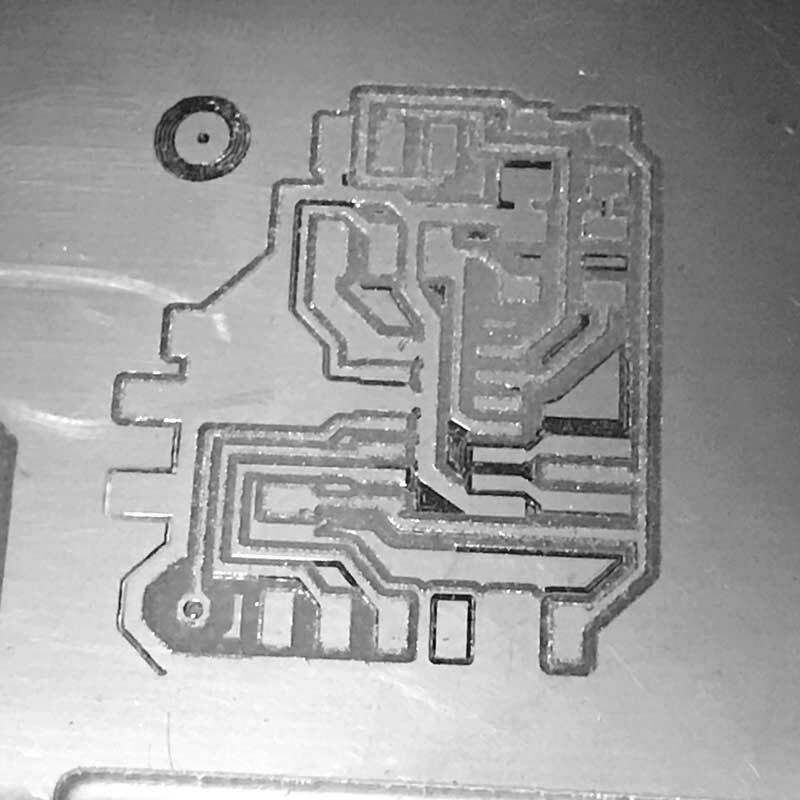 I paused the mill and added 0.05mm of depth to the trace cuts in Fab Modules. Without changing the XYZ origins, I loaded the modified tool paths into the CNC mill and recut on top of this flawed version. Problem solved. 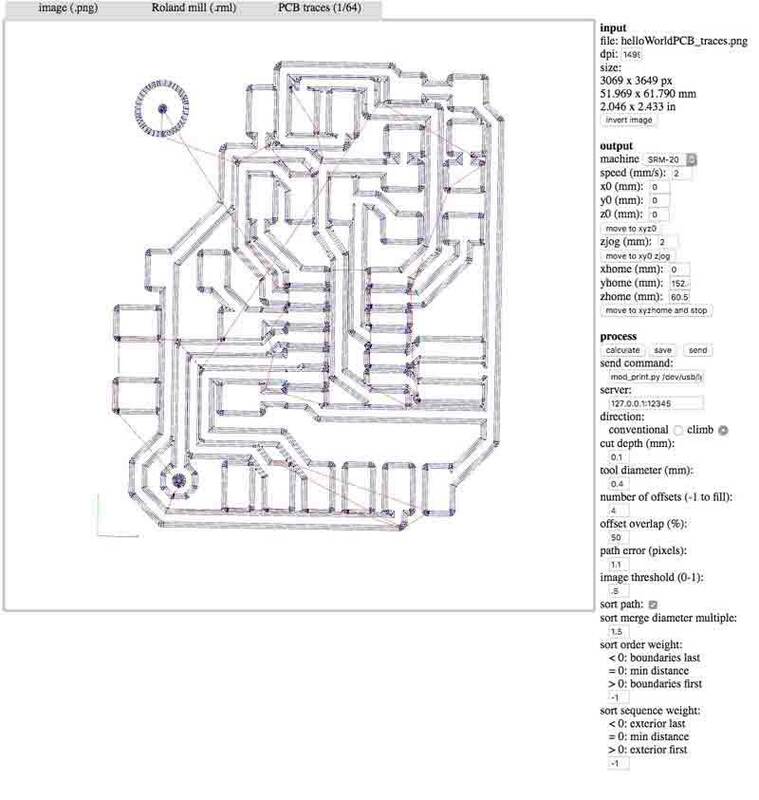 The mill has cut my PCB. 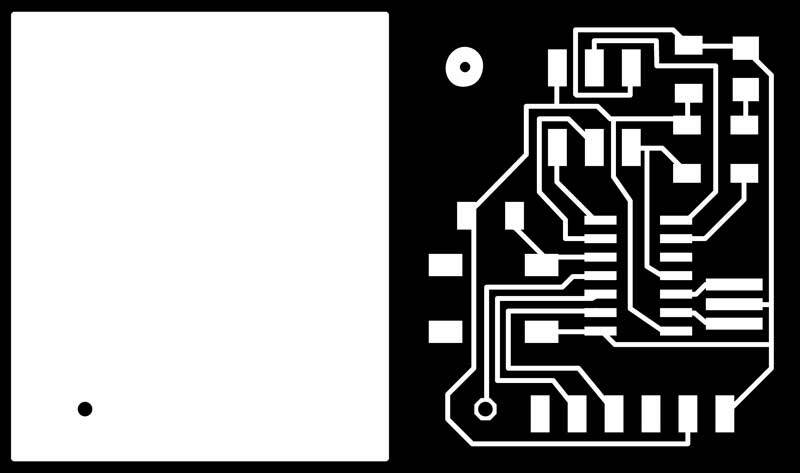 The template I chose for the 1x1 pin header was for a size not stocked in the lab so the pad and hole were too small. I opened the hole with a drill press and resolved to solder along the trace.